Did you know that 73% of people who start filling out a web form abandon it after only completing the first few fields? Forms that contain a Date of Birth field cause the most amount of people to stop filling out a form, followed by Phone Number. Forms are abandoned for multiple reasons, but the most common reasons include: the amount of fields that are required to be filled out, the type of information that is being asked, and the ease of filling out the form. Web form leads can be the hottest leads your company acquires, so making sure your forms are quick, simple and easy to fill out, can help decrease abandonment rates. The shorter your form, the better. Forms that are too long are unappealing because people don’t want to waste time filling out 8, 10 or even 12 fields on a web form. The longer the form, the more time they have to think about the information they are providing you, which can cause them to second guess giving you their personal information, leading to higher abandonment rates. Best practice suggests keeping your forms to no more than 4 or 5 fields. Technologies, like RingLead’s Intelligent Web Forms, can help reduce the number the web form fields you are currently using, without sacrificing the quality of leads you receive. Along with keeping your web forms short, you should also make them simple to fill out. Don’t ask for information that is going to force the user to have to think too hard about the answer. Fields like first name, last name, email and company are effortless fields that users can fill in quickly. Once the form is submitted, you can then enrich the record with other contact and firmographic data points using technology like RingLead’s Intelligent Web Forms, to give you more information about the lead, without requiring the user to provide it themselves. Even though you may have decreased and simplified the amount of fields your lead has to fill in, go one step further by actually helping them fill in certain fields. For example, if a user starts typing “RingLe”, all of the possible company names should be provided so that the user just has to choose an option from the dropdown. By filling in fields automatically, the website visitor has less fields to fill out. 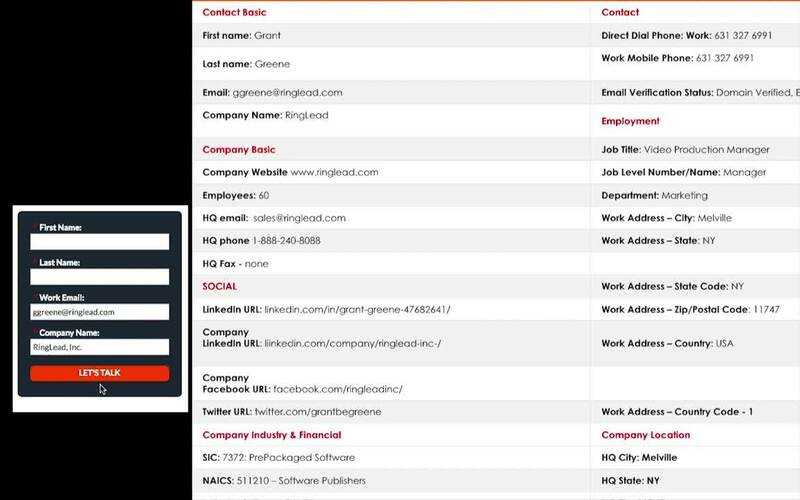 RingLead’s Intelligent Web Forms can do just that, as well as pre-populate the location field on forms by leveraging the IP address of the user, offering a completely filled out field, even before the user enters their name. Mobile devices account for 50% of web page views worldwide making it more important to make sure your web form is accessible on a mobile device. Web forms that aren’t optimized for mobile use, usually make it more difficult for people to fill out, ultimately causing them to abandon it. RingLead’s Intelligent Web Forms are all 100% mobile friendly to ensure you aren’t missing any potential leads no matter what device they fill the form out on. Watch RingLead’s Intelligent Web Form video to learn more about how RingLead’s Intelligent Web Forms can increase inbound lead generation, without decreasing the quality of leads created. Want to see our intelligent web form in action? Schedule a demo today by clicking the “Schedule A Demo” box now!